The Fishing and Hunting map for Cattaraugus County. For fishing it has fishing access, marinas, fishing supplies, privately-owned fishing locations, waterbodies, streams and where a Native Fishing License is required(water with an orange outline). 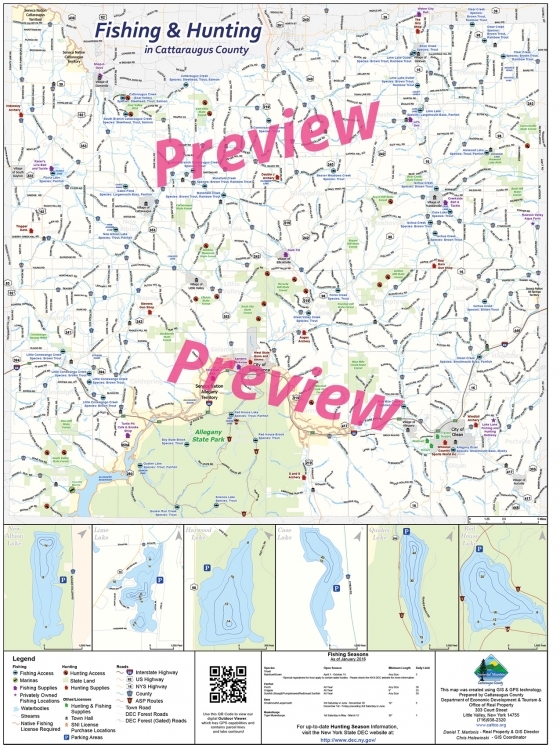 This map has inset bathometry maps of New Albion Lake, Lime Lake, Harwood Lake, Case Lake, Quaker Lake, and Red House Lake. Use the Outdoor Viewer on your smart phone, tablet or computer. For hunting it has hunting access, state land, and places with hunting supplies. This map also has more places with fishing and hunting supplies, town halls, Seneca Nation of Indians License purchase locations, and parking areas. Did you want a dynamic map on your smart phone or tablet? Check out the Cattaraugus County Outdoor Viewer. Updated on Wed, 12/12/2018 - 4:24pm.